Greece, with Cyprus, is the only member of the North Atlantic Treaty Organization (NATO) to have suffered, and to continue to suffer, military occupation of its territory by another NATO state, Turkey, supported by the rest of the alliance. It is the only alliance member to have suffered from British and American plots to wage civil war on its territory – the British in December 1944, the Americans in April 1967. It is the only NATO state to have its seabed, and the resources which lie there, face seizure and attack by the US and Turkey. It is the only NATO state to have been (to be still) compelled by secret treaty provisions to harbour and to project nuclear and other military threats against neighbours or near-neighbours – the former Yugoslavia, Russia, Egypt, Libya, Syria – which do not threaten Greece. In short, Greece is the only country in Europe to be compelled by the force of its purported allies to act against its own national interest. And I haven’t begun to mention the role the German friend has played – puppet king in Athens; Operation Mercury, as the catastrophic invasion of 1941 was code-named; imposition of the European Union’s (EU) Economic Adjustment Programme for Greece, destroying the Greek economy for the past five years. In the media of countries which are enemies to Greece, the election of Syriza to the Greek parliament this week, and of the government headed by Alexei Tsipras, is being reported as radical, extreme, some even claim communist. The reply, which weak and impoverished Greece is about to make, is this: assisted suicide is not Greece’s national choice. There will shortly be a new Greek security doctrine to identify and deter three enemies of state – Turkey, the US, and Germany – and the fourth, if it weren’t already so weak itself, Great Britain. For the secrets of this new doctrine, it won’t be useful to pore through fresh intercepts of what Tsipras, his foreign minister Nikos Kotzias, and his finance minister Yanis Varoufakis are confiding among themselves, according to the NSA, GCHQ and Bundesnachrichtendienst transcripts in circulation. Instead, it’s necessary to start reading the 26 speeches Thucydides (lead image) reported in his History of the Peloponnesian War 2,400 years ago. 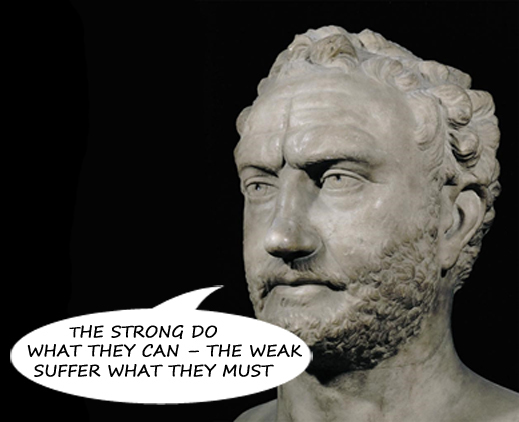 Thucydides has much in general, nothing particular to say about Russia. But there is a 245-year old term in Greek for the Russian ally who proves to be unreliable in war, faithless and corrupt in peace. That term is Ορλωφικά (Orlovika). For its history and application to Greece and Cyprus since 2013, read this. Russian officials who troop into Megaro Maximou, the prime ministry in Athens, to confide their congratulations and hopes for warmer relations aren’t more credible than was Count Alexei Orlov, the Empress Catherine’s emissary and naval commander in 1770. May 13, 2014: Valentina Matvienko, Speaker of the Federation Council, told Tsipras that “Greece views Russia as a strategic partner”. Against the plots and plans of the friends who are Greece’s enemies, there is also the experience of Greek history of the 1980s (my history, too). That shows how little the friend who is the enemy of Greece’s enemy is worth when Greece’s life and death are at stake. It is already clear that Putin, on the advice of Igor Sechin, Igor Shuvalov, and many others, has cast a strategic card on Turkey. The alternative card Greece has to offer isn’t obvious, at least not to the Kremlin, and not yet. So when the Americans, British, Germans, and Turks revive against Tsipras – as they are certain to do — the infowar and regime-change tactics used against Andreas Papandreou between 1982 and 1989, the Kremlin cannot be counted on to support Greece’s rebalancing of power. Twenty-six years ago, it was the Politburo’s conviction – spelled out in secret in February 1989 – that Papandreou was an American puppet who could not be relied upon. The Politburo was wrong about Andreas; it proved to be right about his son, George Papandreou (below), the fool and coward who has been dismissed in Sunday’s poll with a 2.7% vote — the first time in a century that no Papandreou is judged by Greek voters worthy to represent them in parliament. The NATO script of the 1980s can already be read in the tweeting of the enemy press in London, Berlin, and Washington. Tsipras is unlikely to rely on public relations agents or on the ambassadors of his foreign ministry to fight back. More fundamental Greek tactics are being devised, including those which are still not revealed from the 1980s. It will take more than ceremonies at Greece’s cemeteries to remember the victims of German war crimes and Turkish genocide. The modern Δροσουλίτες (Droussolites) have much to remind, but not in public. 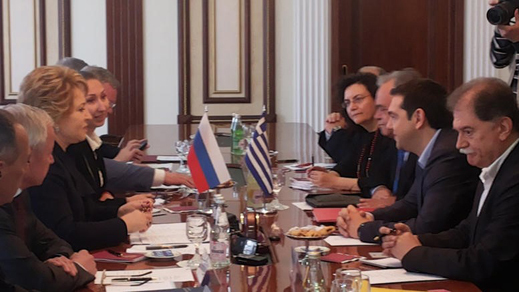 The Greek agenda for the Kremlin is already obvious – resumption of the food trade; rouble tourism; Cyprus; a new gas hub for southern Europe; NATO in Ukraine and the Balkans. For these negotiations it is also clear that Russian oligarchs and Gazprom fixers, and their Greek counterparts, who have dominated the relationship with Athens in recent years, are unacceptable to Tsipras. Officials like Sechin, Shuvalov, and the circle around Prime Minister Dmitry Medvedev also showed themselves in their Orlov colours during the negotiations for the Cyprus bailout loan of 2013. By Athens they can be ignored. But if not them, with whom among the Russians can Tsipras speak? Which of them has read Thucydides? Just one – Yevgeny Primakov.